Please visit our registration page to register now!! If you have signed your child up for Sharks Tackle Football , it is imperative that you go to the DMV NOW, because it could take 10-14 days to receive the ID in the mail. DMV no longer issues ID on Site. Please see the announcement below. IF YOU ALREADY HAVE A CHILD ID CARD, you need to check the expiration date to be sure that it doesn't expire before Sept. 18th. Issued to a child under age 15. 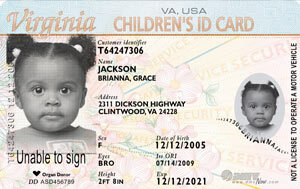 Requires one identity document for the child such as a birth certificate or passport. Expires on the child's 16th birthday. If the child's name appears on the parent's legal presence document, that document governs the expiration date of the child's legal presence. You will receive your new ID card in the mail. Customers will receive newly designed secure cards by mail. Customers renewing Virginia ID cards can keep your ID card to carry with a receipt, until you receive your new ID card in the mail. DMV has converted to a new secure process for issuing driver's licenses and ID cards and has discontinued issuing them over the counter. The new secure process is similar to the U. S. passport process and reduces the risks of fraud. Make sure DMV has your current, correct address on record. If you have moved, notify DMV right away. Your license will be mailed to the address in DMV records. The U.S. Postal Service will not forward driver's licenses.